I feel like I’m home. It’s as if I’ve been traveling the expansive Egyptian desert for countless nights, and have finally reached my destination. A place that I always knew existed, but one that I had never experienced personally. Assassin’s Creed Origins has journeyed back to where the Brotherhood first planted its deep-seeded roots, and with it has rewritten itself as a game. Like any good origin story, the newest entry in the series has revitalized and revamped everything that initially attracted many of us to the franchise. It’s been some time since a game enthralled me in the way that Origins has, and driven me to discover every secret that it held long after I completed the main story. Origins puts you through the trials of Bayek of Siwa, easily the most likable Assassin’s Creed protagonist since Ezio; arguably even more so as an ultimately altruistic character whose benevolent acts consistently better the lives of those around him. The story follows Bayek on his quest for vengeance against an Illuminati-esque organization known as the Order of the Ancients; a largely solo journey fraught with much introspection. Bayek is a Medjay, a protector of the city of Siwa in Egypt, and he holds that position with a deep-seeded feeling of responsibility to those in need around him. 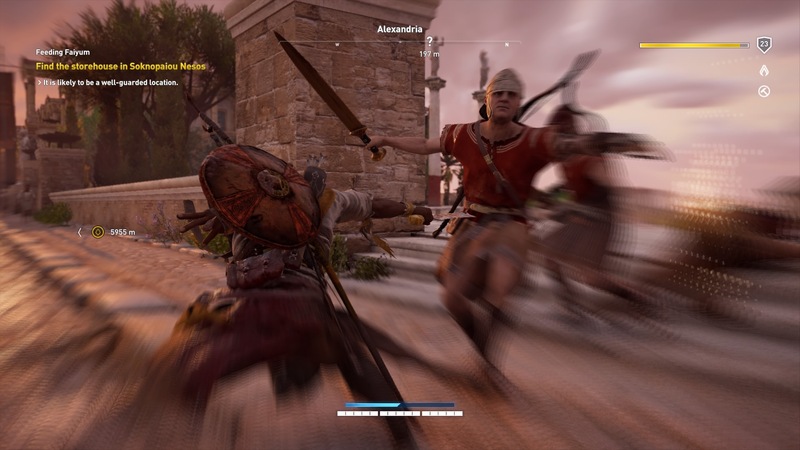 As your adventure progresses, Bayek consistently finds himself wrapped up in the struggles of Egyptians, often downtrodden at the hands of imperialist Greek aspirations. There is so much to unpack in Assassin’s Creed Origins that it’s almost hard to know where to start. The game is absolutely massive in terms of both geographical and mission scope, and has set a new and exceptionally high bar for the series. Egypt has captivated me much more than Paris or even London, and numerous times I found myself wandering in random directions without checking the map just to see what was over the next sand dune or beyond the pyramids on the horizon. Often I was rewarded by my curiosity, but almost every single time I was delighted; coming across a new oasis, tomb, or town which ultimately held new people and insights into the world, along with a quest or collectible to acquire. The only occasions in which I typically stopped exploring and found my way back towards my main objectives was when I encountered an enemy which greatly overpowered me. Assassin’s Creed Origins’ regions are divided by level, and ignoring this fact can lead to an immediate sarcophagus. 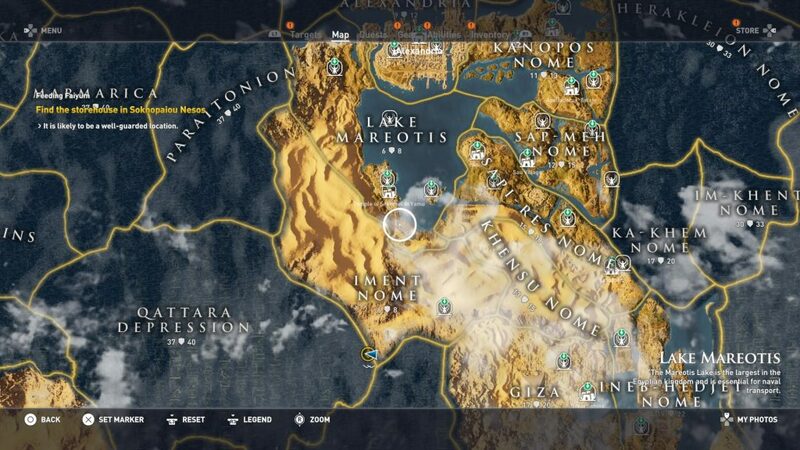 Entering into a new territory far above your level is very possible in the expanse of Egyptian provinces, so it’s lucky for hapless wanderers like myself that the game tells you when you enter a new region, giving you an opportunity to consult the map. Origins is easily the most open-world game in the entire series; perhaps comparable in a sense to Black Flag, although I would argue there is much more to explore and occupy yourself with in Ptolemaic Egypt. While previous games in the franchise have always been more RPG-lite, Origins can assuredly be considered a full RPG. 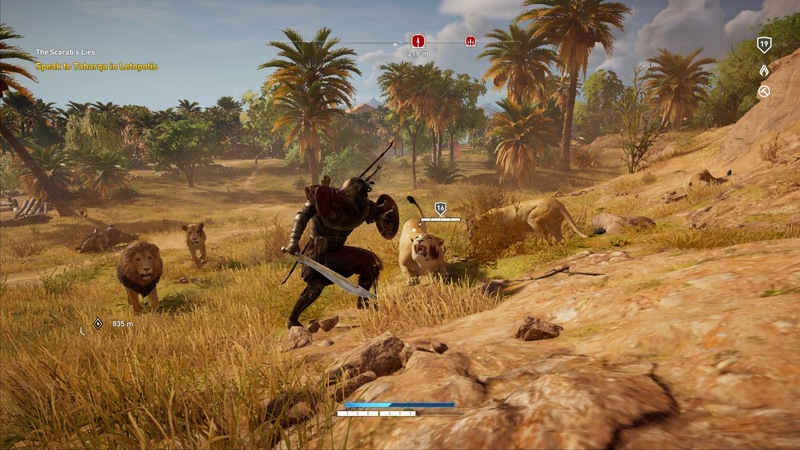 Bayek gains experience and levels based on the difficulty of enemies, and unlocks skills through an extensive tree split into Hunter, Warrior, and Seer. 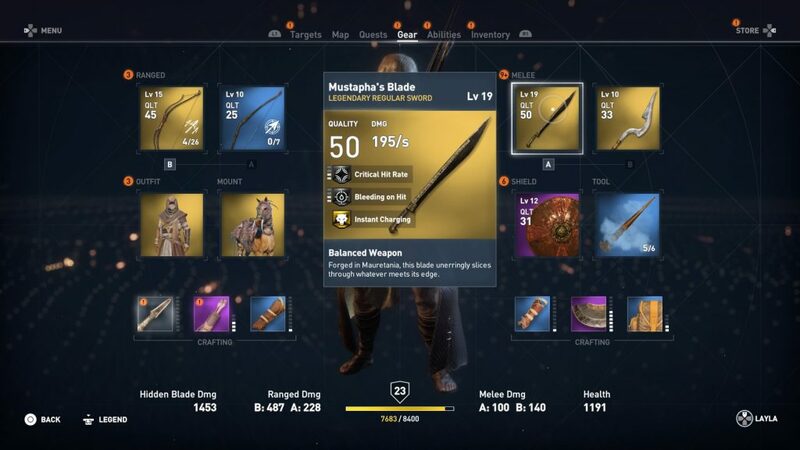 Much like Bayek, the strength of your equipment is determined by its level, and you can loot equipment from enemies and treasure chests scattered throughout Egypt. The transition to a more concrete RPG system has not caused the game to stray far from its roots though, and I would argue has helped it to find more stable footing in these number-based systems. To coincide with this shift in mechanics, Ubisoft has almost completely overwritten the controls for Assassin’s Creed Origins for the first time since the beginning of the series. Long time followers of the franchise will likely take an hour or two adjust to the new system and button layout, but it has ultimately brought more substance to the game. While there have been small tweaks to the formula along the way — changing how combos chain together, using the two-tier movement system, adding and removing gadgets — the game has always retained a relative familiarity to it, mechanically speaking. The latest iteration in the series is a far divide from parrying in all directions, chaining 20+ kill combos, and generally feeling like some sort of assassin-god. Instead we have been treated to a more personal and visceral combat, where you can lock onto targets, and fights are won or lost through the proper use of a shield. You are never without your faithful shield by your side, and it took some getting used to as the first game in the series to feature a shield as your primary defensive mechanic. Holding left bumper allowed me to maintain a block, although some enemies can swing unblockable attacks which required dodging out of the way. 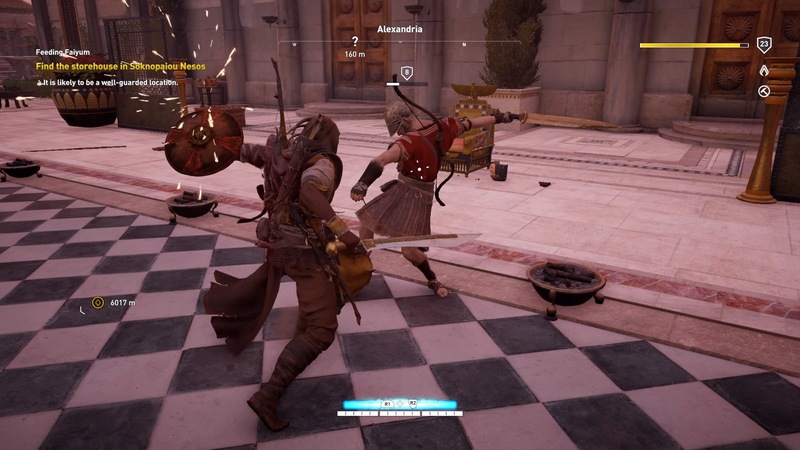 Once you’ve unlocked the ability you can parry attacks with your shield, but it requires far more precise timing than the chained-parries of previous Assassin’s Creed games. For your melee weapon you can choose from seven different categories of weapons; from swords to cudgels and spears, as well as a fast dual-wield option which was my personal favorite. Within each archetype you will find several additional varieties of weapons allowing you to further customize your playstyle, many with status effects from increasing your critical hit rate, to adding a deadly poison to the blade. Each weapon has a very distinct feel and combat style, and you can enter combat with two melee weapons equipped allowing you to easily change your fighting style on the fly. Weapons additionally have unique Adrenaline Moves, which are another first to the series. Adrenaline builds as Bajek persists in fights, and when the bar is full he can unleash a devastating attack or flurry of blows, depending on the equipped weapon. In addition to having a veritable arsenal of melee weapons to choose from, there is also an array of bows to suit any situation a Medjay may come across during their travels. Each of the four different types of bows are useful for a very specific function: charged shot, rapidfire, multishot, and precision. From here, they can be upgraded through the skill tree to unlock a special attack for each bow. My favorite was easily the precise Predator Bow, which allows you to control your arrow for a brief period of time to hone in on unsuspecting foes. The ranged combat features heavily in Origins, and having the right bows equipped for each situation became more vital as the game progressed. There is no shortage of weapons to choose from, all of which can be continuously upgraded to match your level. If you find a Legendary weapon early in the game, you can actually bring it with you right to the final battles with the system. It’s a very welcome — and oft unseen — balance between typical RPG-weapon systems which often force you to find or create new weapons, and discard treasured favorites from early game. Assassin’s Creed Origins opts to focus on several key items to supplement your combat. I would divide tools into two categories: equipped tools which you need to switch, and active tools which you will always have on you. Darts have made a triumphant return with sleep, poison, and berserk varieties at your disposal, and the poison variety featured as my core active tool for the majority of the game, in addition to a firebomb or two when I needed to go loud. These feature as your two ‘equipped skills’ and you can only have one specific variety equipped at any given time, although switching between them is fairly painless. You unlock active skills including Smoke Screen (the replacement for smoke bomb) and Flesh Decay (a trap which turns corpses into infectious death-traps), which are always equipped so long as you have enough ammo in your inventory. Other passive skills like Animal Training were an exceptional boon during later areas of the game, allowing me to use sleep darts to turn a vicious pride of lions into my catastrophic outpost assault team. Overall between the combination of a plethora of different types of weapons and an array of supplementary tools, combat is extremely satisfying. It’s not the same type of satisfaction as previous games which made you feel like an unstoppable juggernaut, but a more real and personal feeling of achievement for truly hard fought battles. Becoming surrounded is no longer an opportunity to show off your stylish kills; it’s a brutal test of reflexes and snap-judgements which leave only the true Master Assassin standing. Encountering the deadly Phylakes, bloodthirsty hunters send by Ptolemy for Bayek’s head, are the true tests of your mettle in Origins. When you hear the horn announcing their presence, only those truly versed in the new combat style — and leveled up to at least 25 or 30 — should stand and fight. Your Bonelli’s eagle, Senu, is another welcome addition to the game, and the ability to use her to detect quest items and tag enemies is a boon with the shift towards a minimalist horizontal minimap at the top of the screen in lieu of the series’ traditional radial map. The ability to take Senu anywhere — literally anywhere — without restriction is another fantastic feature. 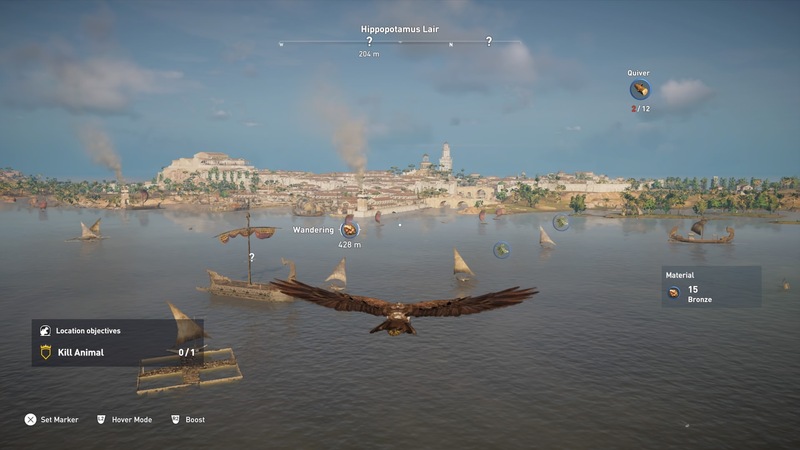 Typically your animal companion would be restricted to your general proximity, but multiple times I took Senu far across the desert, taking in the sights of Egypt from the eagle’s eye view. There is something to be said about being able to experience the entire game from that perspective, and use the well-implemented Photo Mode to capture the majesty of the landscape. Did you think that was it for the new additions? Not even close. Ships are back in Origins, and large-scale battles allow you to take control of Bayek’s wife Aya, and experience the story from her perspective serving the Egyptian royalty. While these missions don’t encompass an exceptional amount of the game, they serve as a fantastic aside to the dry expanse of mainland Egypt. The controls are very reminiscent of Black Flag during these sections, perhaps one of the most familiar aspects of the game. As Bayek you’ll encounter military triremes patrolling shipping routes throughout Egypt, and be able to pilot small fishing boats. I think the team has done a really good representing both military and economic shipping presence in 48 B.C.E. There are even ship-chauffeurs who come and pick you up if you’re swimming in rivers or lakes for more than 30 seconds. It’s quite nice; they’ll let you borrow their boats and take them anywhere you please. 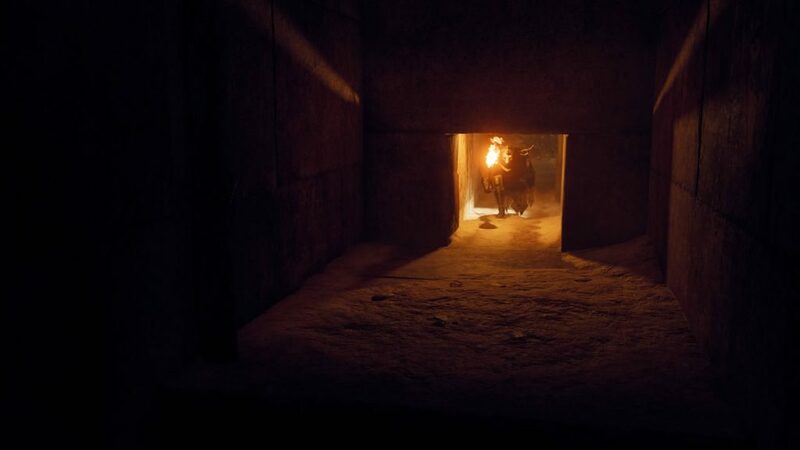 There are a wealth of sidequests in Assassin’s Creed Origins which constantly distracted me away from Bayek’s personal quest to take down the Order of the Ancients and free Egypt from their tyranny. There is even an entire Arena-based combat system which stands apart from the main game and allows you to fight in Coliseum battles against increasingly difficult enemies, which I will be detailing in full in a future feature. The expanse of side activities added weight to the historicity of the game, which is exceptionally on point even for an Assassin’s Creed game. While the series has had its ups and downs, one constant that has always remained has been Ubisoft’s ability to create a realistic and historically-rooted setting. Egypt is no exception to this, and perhaps may stand as one of their greatest environments to date. I could write an entire article just on the architecture in Origins alone. The team has perfectly captured Greek-influenced Egypt towards the end of Ptolemy’s reign, with the rising Corinthian pillars and almost Athean style of Alexandria, to the more classically Egyptian Memphis or Giza with reliefs of Hieroglyphics telling the stories of Anubis, Horus, and Rah. You can see and feel the huge cultural impact of the Greek diaspora, which had been influencing the region for several hundred years. You will experience firsthand the clash of the religions and culture especially in the Greek cities, often woven fluidly into sidequests and Bayek’s own personal journey as a Medjay. This is what makes Assassin’s Creed Origins feel so alive. The verisimilitude; every little factual historical tidbit, every religious story, the accurately constructed cities and towns. I was consistently impressed at little notes that while minor, added so much weight to accuracy of the setting. 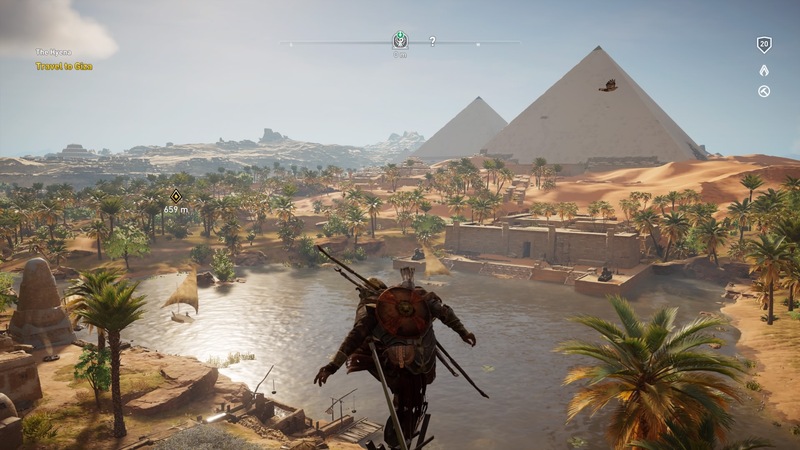 From accurate depictions of embalming procedures — “Brains, what a useless organ” — to helping perform extended fertility rituals from Ancient Egypt, Ubisoft has done their research. It’s not a perfect historical representation of 48 B.C.E., but it’s damned close. There was one moment that Bayek was conversing with an embalmer trying to get to the bottom of who has been tampering with the mummification process, when the embalmer tells you to stop bugging him and “Go read Herodotus.” Without skipping a beat, Bayek responds “The Father of Lies? I hear he’s overrated.” As a former Classical Greek historian, I almost doubled over at this. Bayek throwing shade at one of my favorite classical authors; often actually referred to in Modern Times as the “Father of History.” Suffice it to say, I felt right at home in Egypt towards the end of the Ptolemaic Era. For the most part the sidequests in Assassin’s Creed: Origins are altruistic. 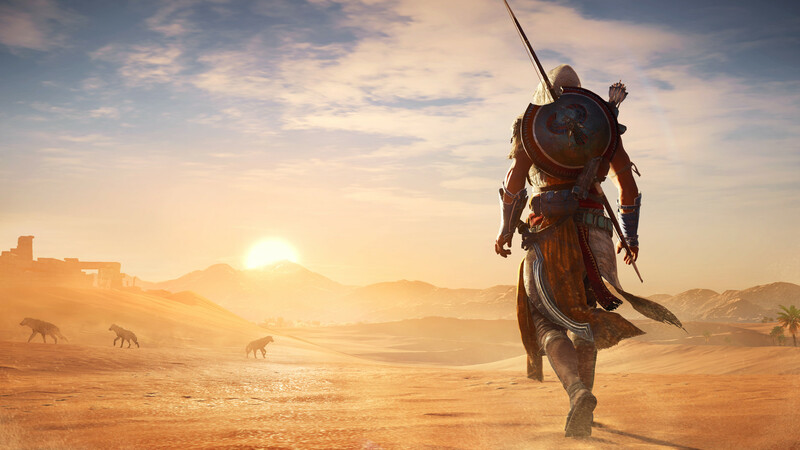 Bayek does not typically do things for personal gain, and is instead driven by his quest for vengeance and protective duty as a Medjay, and his love for his family. What ties the majority of the activities together is that they have a depth to them not often seen in sidequests. You won’t encounter a generic fetch quest to pick up X and deliver it to Y, and if you do you will find a substance or gravity to it that makes you want to complete every mission you come across. Many of them relate directly to the main narrative as well, and featured some of the most endearing characters I encountered. Whether I was rescuing people from herds of rampaging hippopotamuses, or getting a farm back for a poor woman who lost her entire family to a noble and corrupt soldiers, the quests and their characters gripped me. At one point I showed up to assist a tanner, who proceeded to punch a crocodile to death before asking for help gathering animal parts for him. 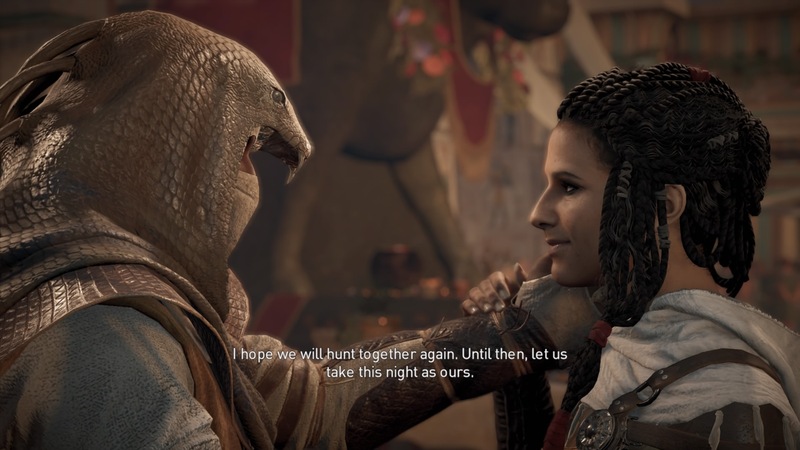 Non-player characters almost never felt two-dimensional, but had real personalities which made you feel for their struggles and want to take up Bayek’s Medjay cause as your own. With all of the praise I’ve lauded on Origins, the game is not without some minor flaws. Several times the game froze randomly for a second, and once I glitched through a bamboo cage a little bit. But that was all. For a game this size, I was expecting to encounter a few more bugs, but it was a relatively smooth experience on the PlayStation 4. 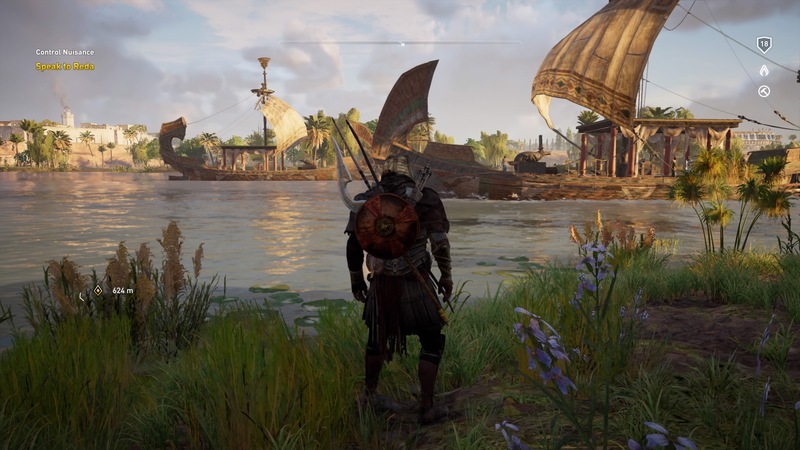 Apart from a couple innocuous bugs, I find myself having a hard time leveling concrete flaws or criticisms against Assassin’s Creed: Origins after my 60 some hours playing it. Part of the series’ issue in the past couple entries has been that there was almost too much to do. Syndicate did a great job at dialing back the extraneous collectibles, but the sheer amount of chests and Animus glitches with ultimately minimal payoff apart from an achievement or experience was nigh-exhausting. I recall opening Unity‘s map and having to zoom in exponentially because all I could see were the various markers clogging the entire overview. Don’t get me wrong; it was great to have collectibles which added to the historical setting as I trekked from mission to mission, but at a point it became a little tiresome. Assassin’s Creed Origins has almost wholly done away with these types of collectibles, instead opting for a location-based system which I think only enhanced my desire to keep exploring Egypt. Notable buildings, tombs, and Camps contain treasure chests, and finding them completes the location for an experience bonus. There are no extraneous collectibles; just crafting resources and weapons that make seeking out these collectibles a boon, not a chore. Overall Assassin’s Creed Origins is the most polished game of the franchise in years, and a remarkable achievement in atmosphere, gameplay, and narrative. You can tell immediately the expanse of work that was put into the project, and the team’s four year development time has paid off exceptionally. Assassin’s Creed has returned to us a franchise almost wholly reborn; it feels like Ubisoft took everything that worked really well from previous games, polished it even more, and used their experience and expertise to take the series to heights I never thought I’d see. The decision to move more fully into the realm of RPGs with an expansive open-world map have culminated in what will likely be my pick for Game of the Year, and both fans of the series and those who have strayed in previous years should take the time to experience this game and all it has to offer. Completely revamped gameplay and the most enthralling environment to date makes this one Origin story you don’t want to miss. Next articleSix Months of Scholarly Gamers!